Christine Saur was born in Vanstel, Montana, on May 12, 1927, to Emilie Mittelstaedt and William Saur. 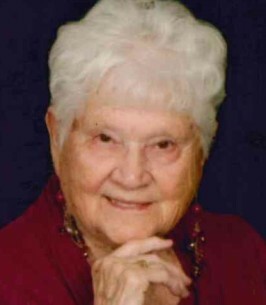 She was raised in Marsh and passed away at her home in Billings on October 11, 2018. She spent most of her life in Glendive, Missoula and Billings. Christine married Ervin Gaetz on June 6, 1948, and was a devoted wife for 65 years until Ervin’s death on October 31, 2013. They raised seven children, Arnold (Luann), Jean (Jim), Jeanette (John), Juliann (Tom), Judy (Scott), Alan (Wendy) and Jolene. She was proud of her 13 grandchildren, Arnie Jr., Brandi, Chad, Scott, Josh, Travis, Amber, Alysia, Shann, Shea, Rachel, Adam and Eli, and 13 great-grandchildren, Crystal, Amelia, Zachary, Jayden, Hayden, Shayla, Kaitlyn, Hannelorre, Luci, Dominiqe, Tristan, Taylee and Atreyu. Christine worked at several different jobs throughout her life and was a devoted mother and homemaker. Her dedication in service to the Lord and Mt. Olive Lutheran Church (40 years) was manifested through evangelism, LWML, stewardship, choir and quilting. Christine touched so many lives. She rests with her heavenly Father and other loved ones. Mom will be lovingly missed! Visitations will be from noon to 8 pm on Wednesday, Oct. 17 at Smith West Chapel, 304 34th St. West. The funeral service will be at 1:00 pm on Thursday, Oct. 18 at Mt. Olive Lutheran Church, 2336 St. John’s Ave. with interment following at Sunset Memorial Gardens. Condolences may be shared with the family at smithfuneralchapels.com. To plant a tree in memory of Christine Gaetz (Saur), please visit our Heartfelt Sympathies Store. We encourage you to share any memorable photos or stories about Christine. All tributes placed on and purchased through this memorial website will remain on in perpetuity for future generations. My deepest sympathy goes out to all of Christine's family! she was a huge blessing to me, I loved visiting with her across our back yards, seeing her and her family enjoying each other, there was always love when they were together. I will miss my friend and neighbor. I wanted to reach out and express our condolences, on behalf of all the HDR staff. Our thoughts and prayers are with you all during this difficult time. Please let us know if there is anything we can do. my deepest sympathy goes out to all of Christine's family! she was a huge blessing to me, Nate, Claire, Mattie, Mollie, and Jackson. our hearts hurt deeply for the loss of our friend and neighbor, Christine. we miss her tremendously!